Let’s switch it out a little! We’ve slowly been introducing our season’s finest, but slowly is the word. I haven’t received any complaints at all, I appreciate the patience. But I feel like I’ve been picking the same things for a while now, and I’m excited to provide a seriously different line of products this week! Chicken for you meat eaters, parsnips, eggplant and peppers sound like a great way to do it too. Of course, we are swimming in potatoes and beans, and I’ll be checking in on some more fruit before the day ends. For those who don’t know, parsnips are in the same plant family as carrots, and are very similar to carrots. In my opinion, they are sweeter than carrots, but may be used in any recipe that would use carrots, or just eaten raw. Parsnips are not often found in the produce isle, maybe because they can lose their crisp easily. When you receive your parsnips, they will not be washed. 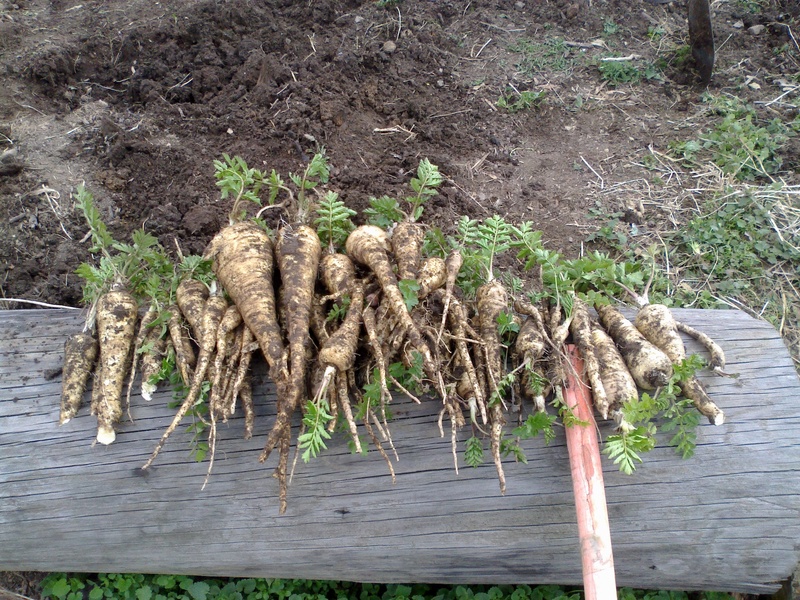 This is only because washing parsnips makes them get “rubbery” faster than leaving the dirt on. We will try to brush most of the dirt off for you. 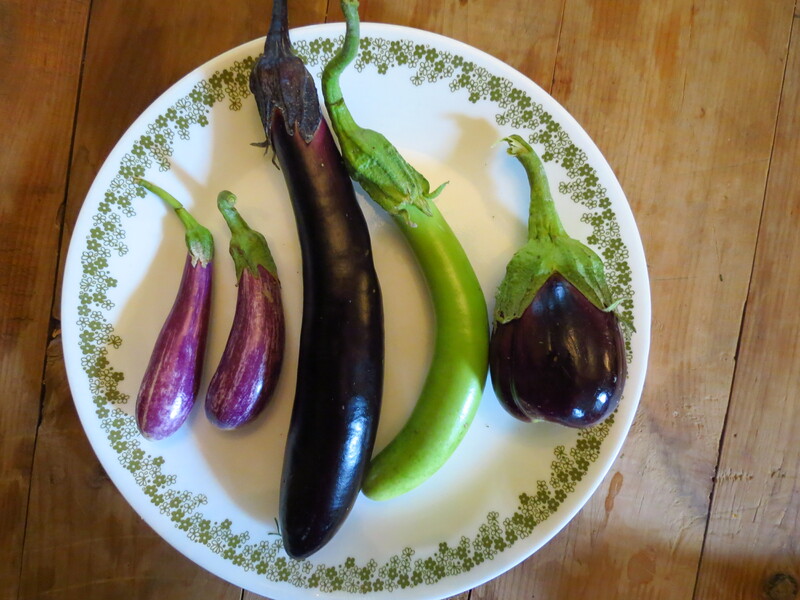 These are the different eggplant varieties we are growing this year- fairy tale, raveena, orient express, and black beauty. I went on a burrito building marathon for my family yesterday, and made the following recipe and it was amazing, I even surprised myself! 2 small Marichi peppers- sliced into rings with seeds removed- unless you like it spicy! Sautee ingredients in a skillet until onions are cooked through. Place ingredients in a food processor and puree. This sauce may be used on veggies, beans or chicken. It made a wonderful addition to our burrito bar. Getting more from the mix! I am so excited about the new varieties this week! 3. Marichi Hybrid Peppers- these are mild jalepenos, but you should remove the seeds if you are wanting mild taste. If you like the spice, leave the seeds in. 7. Chicken for our meat eaters. For our vegetarians- sunflower seeds, walnuts and elderberries. 8. Yes, we have flowers too! Parsnips are my all time favorite vegetable but your eggplant burrito idea will be getting some play in. My kitchen just as soon as I get home! Thank you! Tammy, We love burritos here! They can make the whole crew happy- vegans, vegetarians and meat eaters. Sometimes it can be a challenge to get something for everyone, but burritos always save the day!